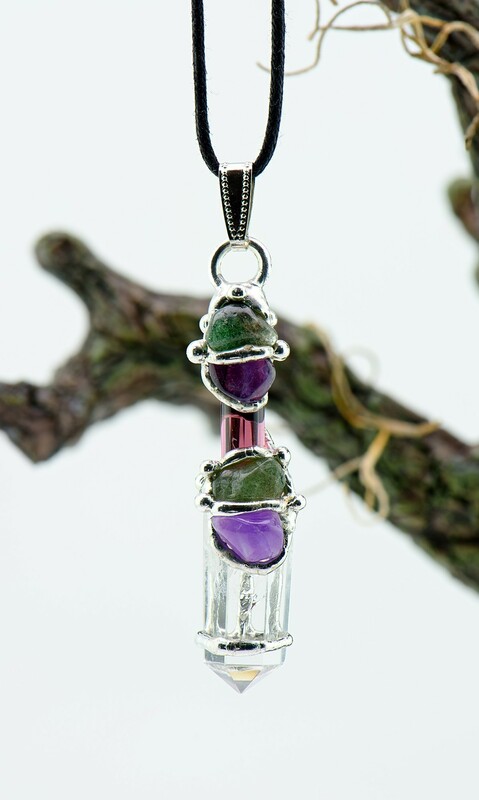 This amulet is hand-crafted from aventurine, amethyst and quartz crystal. Aventurine brings comfort and soothing energy to help dissolve unhealthy thoughts, feelings and physical problems. Amethyst then teaches the wearer to surrender & let go; bringing balance to the body, mind and spirit. We cast this with enchantments that help you to be in tune with your healing powers and energies. The spells enlighten you to the steps you can take to achieve a higher realization of restoration where your 3 bodies are concerned. This includes making more informed decisions about your healing abilities with magic, spirits, entities and using all supernatural tools to help you restore, cleanse and heal. Vessel is hand-crafted amulet from Seeds of Light. This is a stock photograph and each amulet is hand-crafted from natural gemstones so your amulet will be similar to the pictured amulet and contain the same gemstones.